The Newspaper theme comes with some required plugins and optional premium ones, free of charge. The main difference between them is that the required plugins are installed automatically upon theme installation, while the rest of them you can choose to use or not. You can install the plugins in Newspaper Theme only if you need them. With Newspaper theme, you don’t have to search for plugins, as the most useful are already packed in your favorite WordPress template. You can choose to install as many plugins as you would like, but keep in mind that adding too many plugins can slow your website down. Your premium front end page builder. This is a one-of-a-kind page builder designed for the tagDiv themes. Drag and drop dozens of elements into your page, create templates for your articles, build your personal shortcodes, save and reuse them later. Every dream starts with the tagDiv Composer. You can use it free of charge with the tagDiv themes. The tagDiv Cloud Library brings you over 450 already-built layouts. We have designed it to simplify the way you create templates in the Newspaper theme and make your website stand out! The innovative system of tagDiv Cloud Library allows you to import layouts and customize them using the drag and drop functionality. The tagDiv Social Counter plugin brings you support for Facebook fans, Twitter followers, YouTube subscribers, Vimeo, Instagram, Google Plus, Soundcloud and Feed subscribers. Use this premium plugin free only in the tagDiv themes. The Social Counter plugin makes it easy to display your social accounts stats. Discover the new standards on page loading speed and mobile optimization with the tagDiv AMP plugin. We took the Google AMP plugin and tailored it to perfectly integrate with all the features you love in Newspaper theme. Everything is optimized to work seamlessly, enhancing the capabilities of this template to give you a new definition of performance. Do you have news and want to let everyone know about it? The Newspaper theme brings the tagDiv Newsletter plugin and gives you the ability to add newsletter options to your website. It is a very easy to use element, straightforward using tagDiv Composer, the live front end page builder. The Newspaper theme comes with a free license for the Revolution Slider plugin, so you use it to create stunning imagery on your website. The plugin is a bundled one and does not come with an activation code. We provide regular updates for the plugin, so you do not need to purchase it to have access to its functionality, and features. Again, you don’t need to buy or registered this plugin! The Mobile Theme is a feature specially designed to maximize the theme performance on mobile devices. This is the ultimate challenge: making mobile experiences as fast and rewarding as the desktop ones. We took all these aspects back to the design board and solved them by creating the new Mobile Theme feature. WPBakery is a popular page builder you can use with the Newspaper Theme. You don’t have to buy or update this plugin. As the author is updating the plugin, we test the changes for compatibility and release a new version of Newspaper Theme that includes the WPBakery update. Installing a plugin is quick and easy with the click of a button. 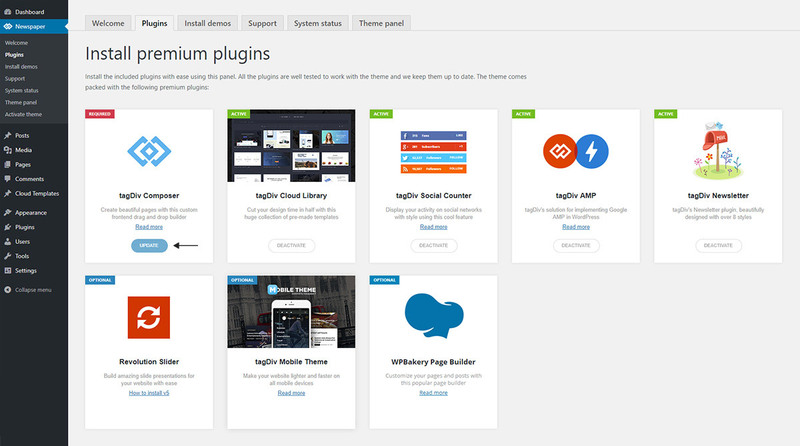 Access the Theme Panel -> Plugins area and click on the install button. This button is dynamic as it will change its functionality based on your plugin status. It should change from “install” to “activate” to “update” depending on the scenario. In this section, we cover the necessary steps required for updating a plugin. 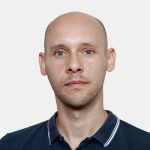 We will show how to update a plugin in Newspaper theme using as an example the tagDiv Composer. The Theme package includes the latest version for each plugin. The theme features an automatic update system for the tagDiv plugins. If an older version of the plugin is active, Newspaper automatically disables it, and you will be prompted to start the update. Following these steps, you can update each plugin with ease. Now that your theme and plugin are ready, start creating the website of your dreams. Have fun while building your website!